When it comes to leaks, condensate line clogs are usually to blame. Your air conditioner will create condensation as part of its normal functions, and the condensate line is what transports it to the drain. So while condensation is normal, seeing that condensation in the form of a leak is not. Condensate lines can get clogged when dirt or other contaminants get into it. Sometimes, that can happen due to a mix of humidity and dirt, thus creating mold and mildew. Your trusted HVAC contractor in North Ridgeville can use a special vacuum to pull that out for you. The evaporator coil is a big block of metal and copper tubes that makes up one vital part of your air conditioner. Without it, the warm air inside your home would never leave. The evaporator coil absorbs that warm air and, figuratively speaking, sends it over to the condenser coil, so that it can be released into the outdoors. In the event your evaporator coil is having issues, however, you might find that it has turned into a giant block of ice. In this state, you wouldn’t be surprised to find it leaking. In fact, many homeowners become aware of the frozen coil due to spotting the leak first. There are many reasons for a frozen coil, and some are extremely serious, so we recommend calling in for repairs immediately. Otherwise, it could lead to a fried compressor (which isn’t cheap to replace). We also don’t recommend trying to remove the ice by yourself—just turn off the unit and let it melt away while help arrives. This isn’t the type of leak you’re expecting at all, since it doesn’t drip water. However, it is a leak nonetheless, and the worst kind that you can get. Refrigerant is the chemical blend that cycles through your AC. It facilitates the heat transfer process that removes warm air from your home, thus leaving you with nice and cold air. To do this properly, the system needs the perfect amount of refrigerant in it at all times. A leak will offset this balance, and it will only get worse as the leak expands. Refrigerant leaks start off as pinhole leaks, so you most likely won’t be able to see or hear them. You might be able to see the tiny bubbles appearing at the site of the leak, but that’s most likely only if you’re specifically looking for it. Refrigerant leaks can damage your compressor and seriously harm your system (and not to mention increase your energy bills). Have someone come right away to fix the leak if your AC has one. Got a leak? 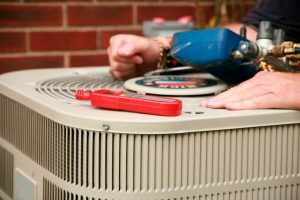 Contact Westland Heating & Air Conditioning right away to schedule service.